Bake a sheet cake the size that you need. Ice the cake in ivory icing making sure it is nice and smooth. Let the icing set about one hour. I used the parchment paper transfer method to put the picture on the cake top. If you wish you may draw it on the cake top using a stylus to make the indented lines on the icing. You will use tip #5 to do all the outline work and the star tip #16 to do all the fill in work. First outline the apple in red icing. Fill in a line of orange icing on both sides of the apple and around the bottom of the stem. Fill in the apple with the red icing. Now outline the rest of the picture with black icing, including the stem of the apple. Fill in the stem with black icing. Make a paper stencil the size of th chalkboard and place it over the chalkboard. Use a black color food spray and spray lightly. Fill in the border of the chalk board with brown icing. Write the message on the board in black icing. The rulers are filled in with yellow, white, and green icing. The end of the notebooks are filled in with white icing. Use black icing and make curved lines over the white ends. Fill in the tops of the notebooks with blue, green, and red icing. The siccors are filled in with dark grey icing. Use star tip #32 and make a star border around the top and bottom edge of the cake sides. 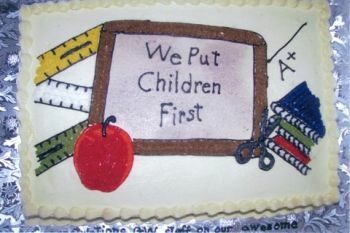 This teacher cake is great for any school related event.